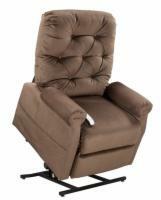 AmeriGlide's selection of lift recliners boasts the lowest prices on quality-engineered lift chairs anywhere, either online or in a storefront. You won't find a better deal on a lift chair anywhere else, so call 1 (800) 797-4654 today to speak with our mobility specialists and start shopping for your AmeriGlide lift recliner! The AmeriGlide 325M 3 Position offers 325 lbs. of lifting power and three-position versatility at a great low price. The AmeriGlide 375M Heat & Massage offers superb comfort at a bargain price - plus, you get a one-year in-home service plan with purchase! The AmeriGlide PR340 Heat and Massage Chair is an incredible value that comes packed with luxurious options.